I wrote a top ten list several years ago of the best lunch games. However, I thought this list could use some updating–and some expansion. The reason for expanding the list is that different groups want different things out of the games they play at lunch. So this is the first of two lunch games lists. This one focuses on games that put social interaction front and center; the second list will focus on strategy games that are satisfying and don’t go beyond a lunch hour. Playtime: Obviously, this one is nonnegotiable. The game must not run over the time allotted to eat lunch (for me, one hour–although several games on this list are shorter than that and can be played multiple times in an hour). 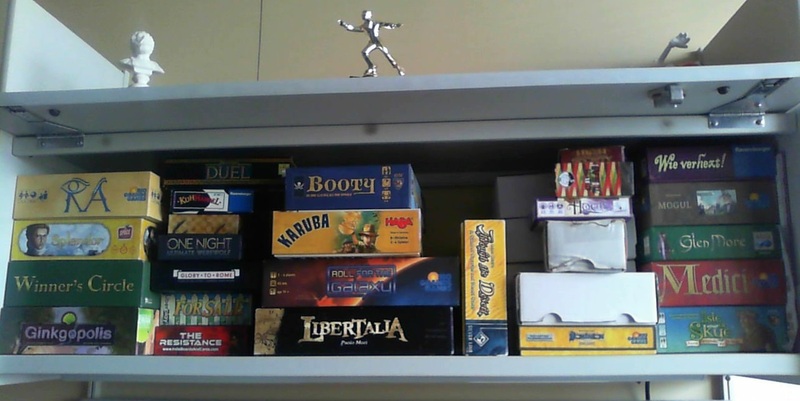 Large group suitability: There are social games that accommodate fewer players, but for this list, I wanted to focus on games that can handle a larger group, defined for my purposes as five or more players. Interaction: Social games should have the players interacting with one another. As much as I love multiplayer solitaire games, they will not do for the social category. Simple rules: No one wants to spend their whole lunch hour learning rules. These games can be explained in just a few minutes but provide a satisfying social experience. Kuhhandel (aka You’re Bluffing!) is a simple bluffing/auction game. 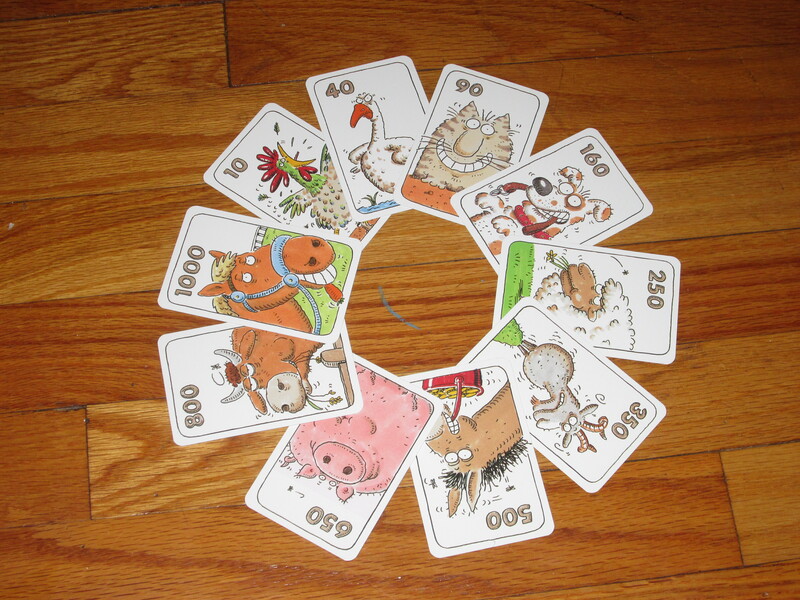 Don’t let the cutesy artwork fool you: it is a cutthroat game of gaining and keeping all the animals. Players try to outguess and bluff their opponents, but there is always the risk that another player will call your bluff and you’ll be stuck. Every action puts yourself on the line, and every decision is grueling (and laced with laughter). The economy of the game is closed, so every dollar spent goes into someone else’s pocket, and so players have to get inside everyone else’s heads. How much do they really want this? And are they bluffing? Even if you’re effectively out of Kuhhandel (which is possible: it’s an older design), it’s still fun to participate and watch the other players. In order to fit this game in an hour, we play with the two-animal auction variant. This game has all but replaced Coup for me. Between Two Cities is a simple drafting game that can accommodate up to seven players easily while still remaining fun. Players sit–get this–between two cities and help two opponents build cities while hoping their contribution will be singled out for glory at the end. There are several aspects of the game that make it interesting, but what makes it social is that players have to work together with their opponents. Because players are scored based on their weaker cities, they really are working for the good of both of their cities, which means balancing the tiles they draft between the two. Even though Between Two Cities is a competitive game, the interactions are pleasant. And they are many as you work together every turn. As I say in my review, Spyfall puts the party back in social deduction games. The rules are simple, and the skills necessary to play well are things that all of us do anyway: try to fit in. 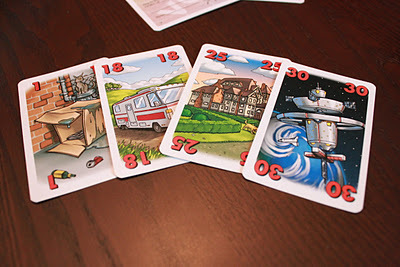 In the game, all players but one receive a card featuring the same location. 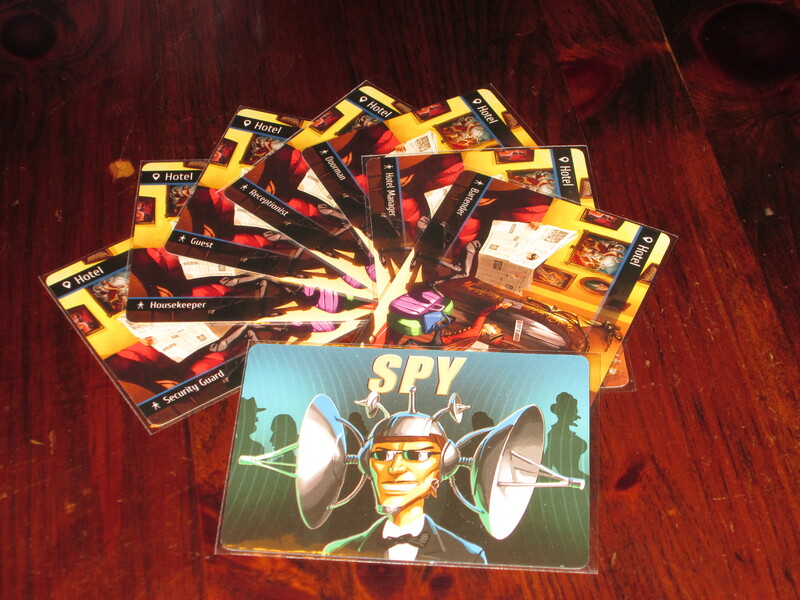 The other player receives the spy card. The game involves asking questions of one another and answering them. The players who know the location are trying to let each other know that they know the location while not making it too obvious to the spy. The spy is trying to blend in and guess the location where the other players are. This game is a blast to play, and while it is nerve-wracking to be the spy, the tension is what makes the game so fun. Unlike other social deduction games, Spyfall doesn’t rely on lying, but simply on trying to fit in. And it’s fun to hear your friends be creative on the spot. A Fake Artist Goes to New York is a similar game to Spyfall: most players know what they are trying to draw, but the “fake artist” doesn’t. Each turn, players will make one mark on the drawing–again, trying to blend in. Each player will make two marks on the paper, and then players will vote on who the fake artist is. A Fake Artist is even easier to play than Spyfall, and since the task is drawing rather than talking, it’s less tense. Fake Artist seems weighted a little more in the oddball player’s favor than Spyfall, but both are fantastic games, and they’re short enough that you can play multiple rounds over a lunch hour. For Sale is two auction games in one. In the first half, you’re bidding money for properties. In the second half, you’re bidding properties for money. The auction system here is super simple, but it’s a fascinating balance, as it’s not always best to win auctions. Players have to balance which auctions are worth winning and which ones are worth punting on. Decisions aren’t too difficult, and there is plenty of room for discussion as you play. I ranked For Sale #1 in my top ten filler games list in my last two lists. And while that’s true, it’s also a great lunchtime game because you can play two, three, or even four games in a lunch hour and enjoy the absurd situations that come up. This is a versatile game and a lunch-hour favorite. 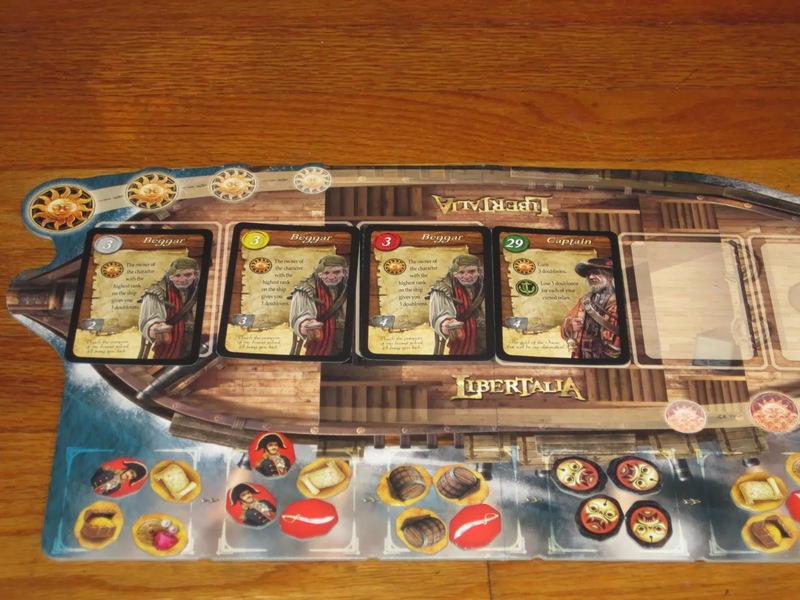 Libertalia is similar to the second half of For Sale, with the twist that each “property” card (here a member of a pirate crew) has a special ability. Libertalia takes what I like about Citadels and makes it faster to play with lots of great interactions. Every player will receive the same hand of cards. It’s how they play those cards that makes the difference. This game is all about timing and getting inside other players’ heads: what are they going to do? I prefer this one with a full (or mostly full) table, and it’s especially fun when players are invested in the outcome. Medici might seem like an odd choice for this list. 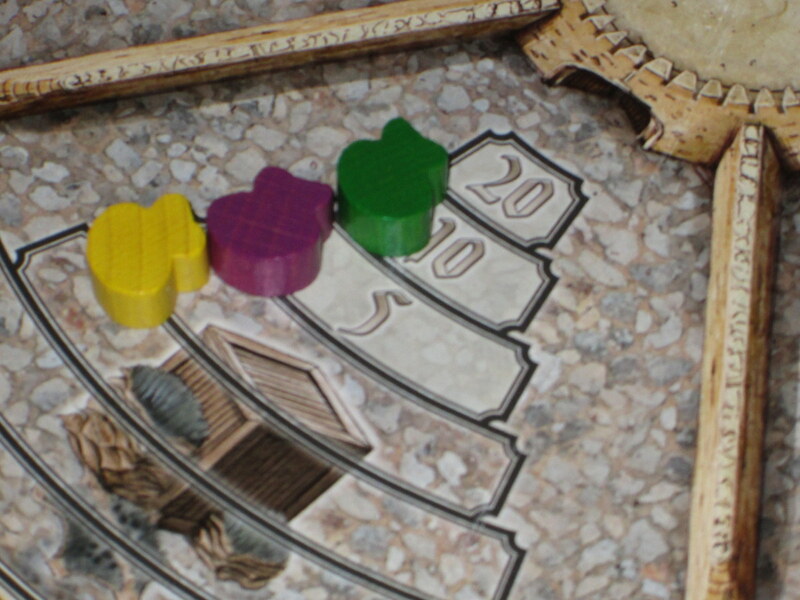 First, the designer is Reiner Knizia, who is often thought of as the designer of themeless Euros. And second, Medici is an auction strategy game. What gives? What places Medici on this list is the raucous good time I’ve had with it every time it has hit the table. What makes Medici such a good time is that there is a lot of player interaction–and not just in the auction. 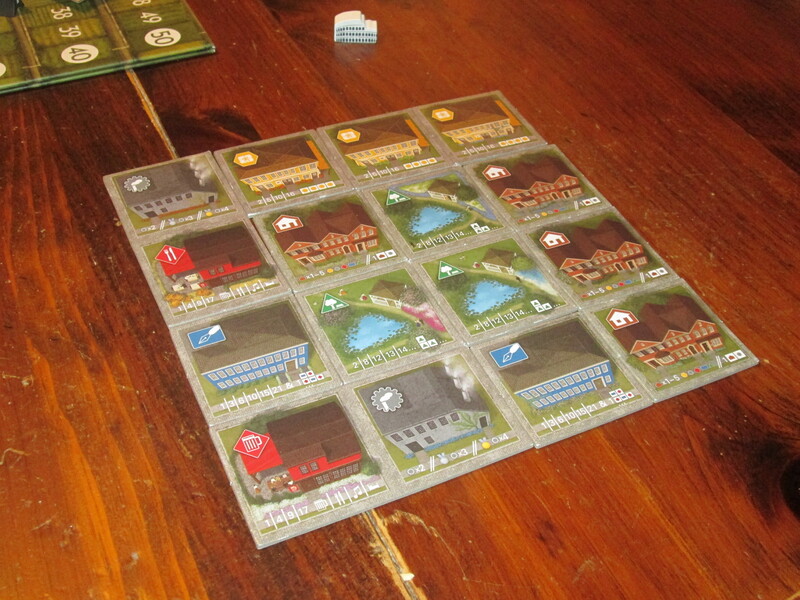 Each turn the player whose turn it is has to put together a lot for auction. This is done by drawing tiles from the bag (or flipping cards, depending on your edition) one by one. A player can stop at one or keep drawing up to a maximum of three. Setting up the lot is almost a press-your-luck minigame as if you draw something that someone else desperately wants, you hope to couple it with junk that they don’t, since each player has limited space on their boats. This keeps all players invested, even if they’re not interested in the lot, as schadenfreude and curiosity fuel the interest. Add on top of this an incredibly clever auction game with the usual interaction auctions brings along, and you have a winning social game. It’s a boon that it’s best at five and six players and still plays in an hour, even with a rules explanation. Social deduction games have flooded the market in recent years, and I used to have The Resistance on my list of top lunch games. The Resistance, however, is very polarizing, and it tends to favor those who talk the most. There’s not much deduction in it; more paranoia and suspicion. Which is fine–The Resistance is still a great game that I like very much. 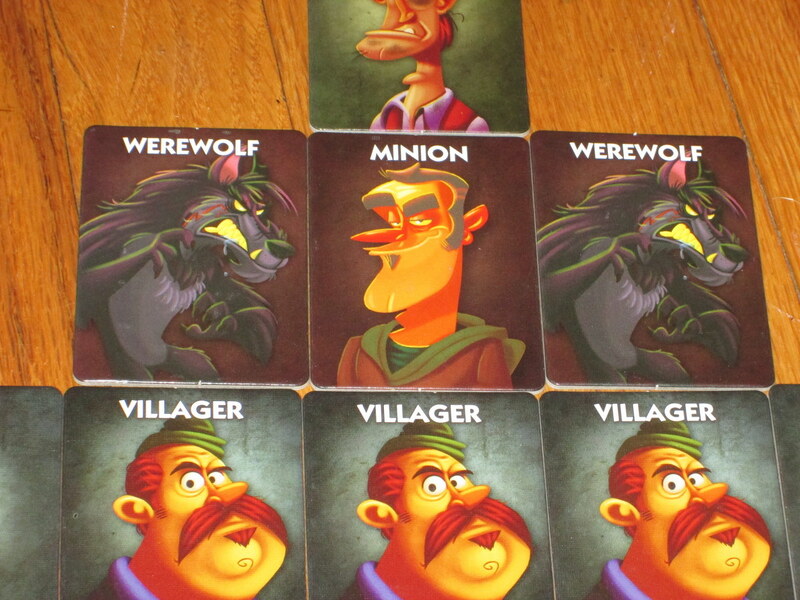 But I like One Night Ultimate Werewolf better in the social deduction category. The reason is that everyone in the game has a reason to bluff. Everyone has a secret role, and during the night, those roles can change. You might want to hold back on truthful information in case someone passed you a werewolf card in the night. Or you might no longer be a werewolf if you started that way. So players, inch by inch, have to solve the puzzle and manipulate the discussion in such a way as to favor their team, all within a ten-minute playtime. This one can fall flat with the wrong group if they don’t get into the spirit of the proceedings, but most of the time this one has been a hit, and especially if you add the Daybreak expansion, you won’t ever see the same game twice. 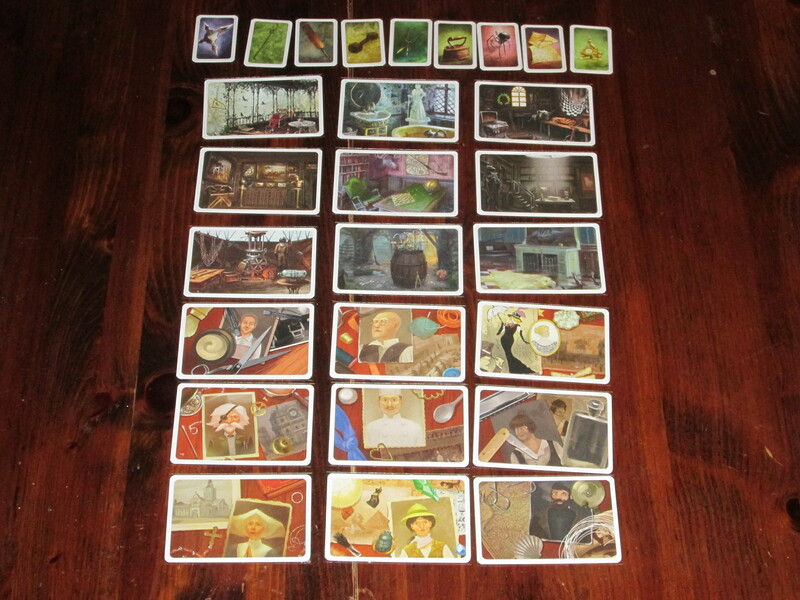 Mysterium is, on its box, a two- to seven-player affair, which already fits my criterion of playing well at five-plus. So why do I list that it goes to ten-plus players? My favorite way to play Mysterium is as a raucous social game. Yes, you can play the creepy, thematic way that the rules specify, but I think the game moves better and provides more pure enjoyment with a large group of players, huddled around the table and trying to make sense of the strange visions they’ve been presented with. This usually involves multiple ghost players who, since they are not alone, have others to sympathize with them in their plight. The joy of making outlandish connections and terrific blunders is what keeps Mysterium coming back to the table, and its short playtime makes it an ideal choice for social gaming in the lunch hour. Witch’s Brew is, unfortunately, out of print in English. However, I was as recently as December able to import a copy from Germany, so don’t let its out-of-print status scare you off this fantastic social game. In the game, players are participants in a potion-making contest. 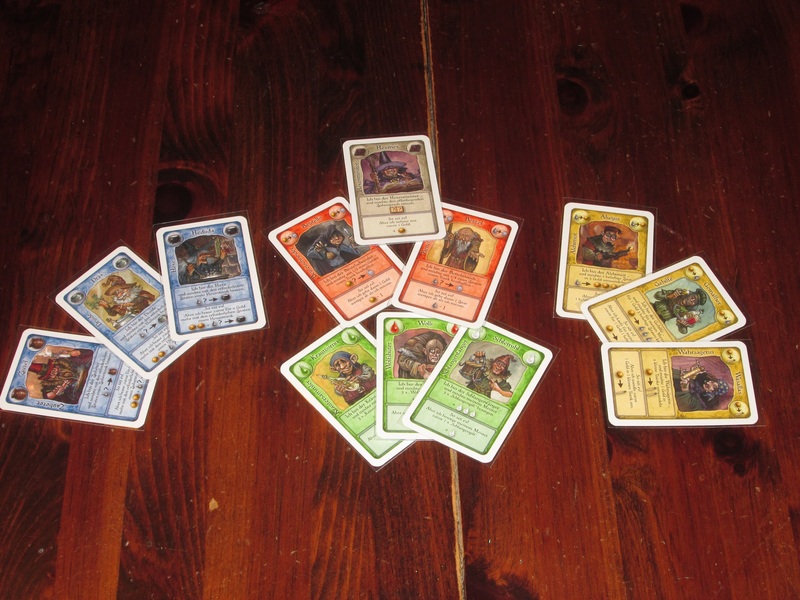 In a round, each player will secretly choose five cards (from a possible twelve) to play that round, and each round begins with a player playing a card and declaring the role. Each other player who has that card will play it in turn order, but they have the option of either risking big on the role or saying “So be it!” and taking the lesser action (the “favor”). Since only one player can actually be each role in each card play, players have to weigh whether they should risk for the big action (which might get them nothing) or content themselves with the lesser favor. Witch’s Brew is a little chaotic, but it is unlike any other game (except, well, Broom Service, its descendant), and the fantastic bluffing and getting into other players’ heads is what keeps it interesting game after game. Witch’s Brew is a little more chaotic, but also more breezy and social, than Broom Service, and while I like both games, I give the edge to the more lively Witch’s Brew. It’s worth tracking down a copy (even a foreign-language copy–the role titles are easily memorized, the iconography is clear enough, and you can speak shoddy German if you so choose, and Schlangenfänger is fun to say). Winner’s Circle is a day at the races distilled. Players will bet on three races, and in each race, they will help to determine the outcome. First, horse cards are revealed and assigned to different horse pawns with different starting gates. Horses have different strengths and move a different number of spaces depending on which face of the custom die is rolled. Next, players place their four bets–one of which is a bluff–secretly and in turn order. 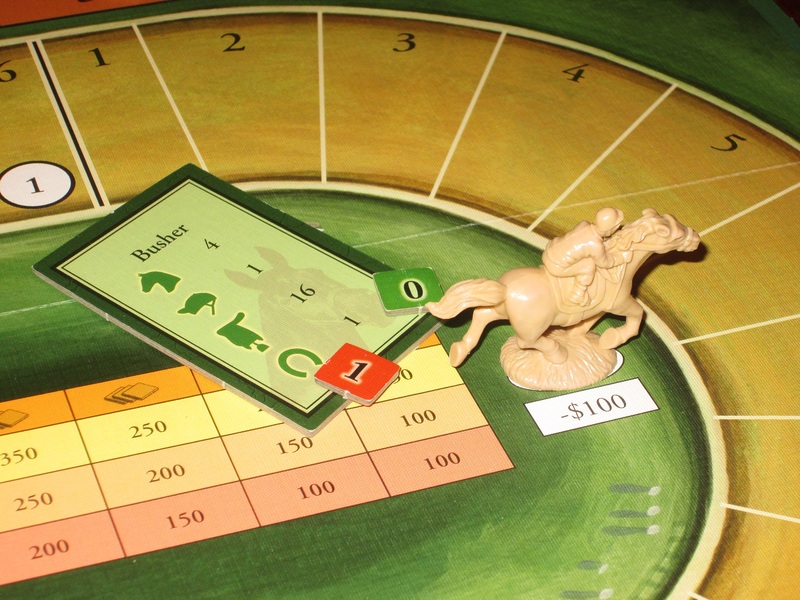 During the race, on a turn, players will roll the die and choose one horse to move the number of spaces associated with the symbol rolled. The catch is that a horse can’t move again until every horse has moved. There is so much to love about this game. There’s cheering for your horse to win. There’s hobbling the horses your opponents bet on when the roll is unfavorable. There’s nail-biting finishes. There’s backstabbing as you realize that the person you thought was interested in your horse’s success was bluffing all along. There’s schadenfreude as other players get their comeuppance. The horses all have horse-race-sounding names, and they take on a character all their own. (Poor, bland Sysonby. And Regret, whose bets always result in, well, regret.) I haven’t played many games that get as exciting as this one. We usually don’t finish all three races over lunch, which would seem to put this out of contention for a lunchtime social game. But even if you play just two races, it’s enough. This is one of the best social game experiences you’re likely to get. Honorable mentions: Codenames, The Resistance, Coup. I like all of these games quite a bit, but for a social lunch hour, I prefer the other entries on this list.